Starting Location: To be announced, but somewhere in Tucson. Level of Difficulty: Most stops along the field trip route will be short and close to the vehicles. The longest walk will be a couple of hundred yards. A lunch and bottled water will be provided both days. Participants should bring snacks and other beverages to suit their needs. Dinner and breakfast in Globe are on your own, but we might try to do a special group dinner if we can find a suitable venue. Car Pooling Arrangements: Carpooling is strongly encouraged to reduce travel costs and number of cars at each stop for safety and logistical reasons. High clearance vehicles will be required as we will be traveling some wash roads. Participants names/contact information will be circulated to registered attendees for participants to make arrangements as needed. Motel Accommodations: We will overnight Saturday, April 30th in Globe. Participants will be responsible for their own motel accommodations. Tour Description: The Spring AGS field Trip will take place over the weekend of April 30-May 1 and will be led by Arend Meijer, who will provide us an introduction to the Paleoproterozoic Pinal Schist, which he interprets as a subduction complex. The trip will start in Tucson, Saturday morning, overnight in Globe, where there are reasonable priced motels and camping, and return to Tucson late afternoon Sunday. 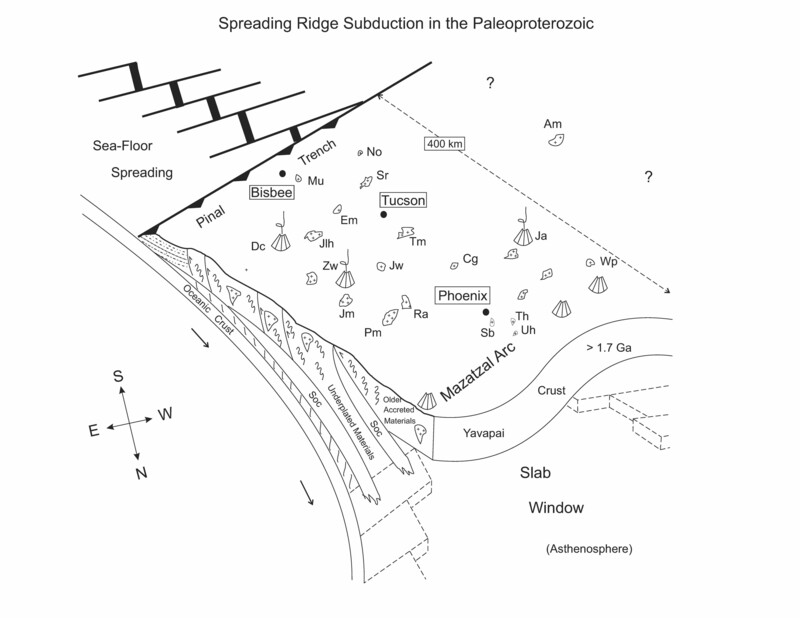 The Paleoproterozoic Pinal Schist of southern Arizona shows many characteristics consistent with the hypothesis that it was part of a subduction complex associated with a Paleoproterozoic arc complex in central Arizona. In a (NW-SE) direction perpendicular to the trend of the arc complex, the Pinal Schist is exposed over a distance of at least 300 km in southeastern Arizona (from Phoenix area to Bisbee). this distance is within the range of modern arc-trench gaps. 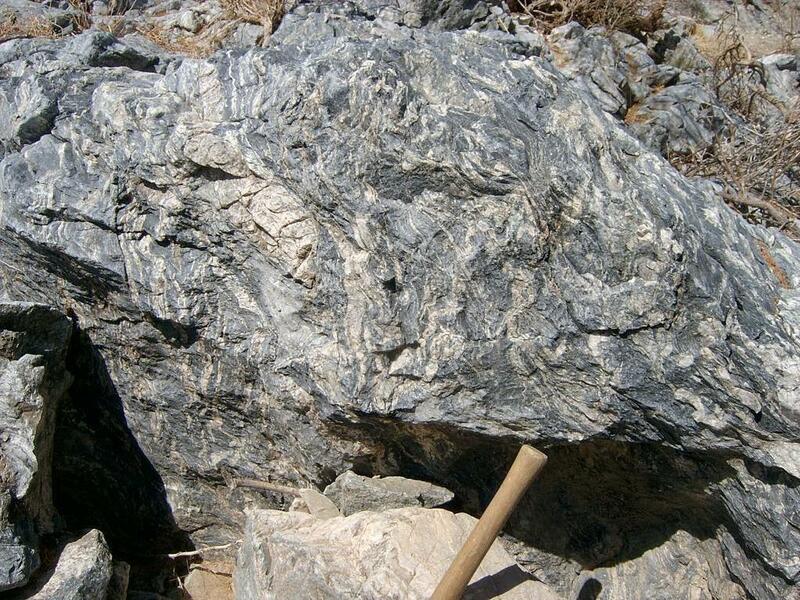 The Pinal Schist is predominantly composed of interbedded quartz-sericite/muscovite schist, and meta-wacke (interpreted as turbidite sequences) with minor meta-chert, meta-conglomerate, and rare marble. The Pinal schist/wacke sequences contain randomly distributed blocks/pods of mafic meta-volcanic rocks some of which appear to have oceanic affinities (for example, EMORB) while others appear to have arc affinities based on trace element abundances. Isolated felsic flows, dikes, and hypabyssal intrusions with arc-like trace element pattern are also present. In addition, there are several larger mafic to felsic volcanic centers within the terrane. Granitoid intrusions also of Paleoproterozoic age are relatively common in the Pinal terrane and these can be divided into two groups. A "pretectonic to syntectonic" group that shows various degrees of foliation, ranges in age from 1.74 Ga to 1.65 Ga, and occurs mainly in the northern portions of the terrane. A post-tectonic" group that is only locally foliated, shows an unusual consistency in ages clustered around 1.65 Ga, is found through much of the Pinal terrane. The metamorphic grade of non-plutonic rocks in the Pinal terrane is mostly greenschist facies although there are local occurrences of higher-grade assemblages. High P/T facies rocks (for example, blueschists) have not been identified in the Pinal terrane in over 100 years of mapping. Structural/tectonic features of Paleoproterozoic ages associated with the Pinal terrane include meta-melanges, shear zones, major thrust faults, and other structures typical of subduction complexes. The geologic and structural characteristics of the Pinal terrane suggest it reflects progressive growth of the Laurentian margin towards the southeast (present-day) between 1.74 and 1.65 Ga. The meta-volcanic rocks with arc-affinities and "post-tectonic" granitoids exposed within the Pinal terrane are here interpreted to reflect a spreading-ridge subduction event at around 1.65 Ga. The volcanic rocks with arc affinities were metamorphosed to greenschist facies assemblages not long (<10 Ma) after they were erupted onto the Pinal fore-arc. This metamorphic episode is thought to reflect an arc accretion/obduction event that buried the Pinal fore-arc beneath the fore-arc of an island arc terrane that came from the south. Most of this accreted arc terrane was eroded off the Pinal fore-arc terrane in the 300 Ma following accretion (prior to the deposition of the Neoproterozoic Apache Group). What may be remnants of this arc terrane are now exposed in northern Mexico. The creation of the Pinal terrane involved a high continental growth rate. The magmatism associated with the ridge subduction event and extensive plutonism within the terrane around 1.45 Ga likely contributed to the high continental growth rate reflected in this terrane and to the preservation of the terrane. Contact: Arizona Geological Society VP of Field Trips, Bob Hildebrand at bob@roberthildebrand.com or (520) 743-5176 if you have any additional questions.